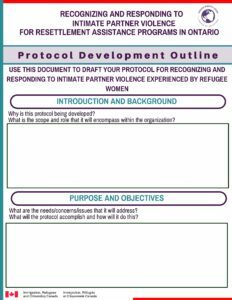 This resource was created to simplify and support the intimate partner violence experienced by refugee women protocol development process. It can be used as the framework for the primary items to be included, and adjusted to suit the specific circumstances and regional considerations of each organization. The tool is structured in a way that will allow resettlement agency managers to draft the document independently or in collaboration within a committee or team context. The document is also reviewed in the protocol development webinar.